If 2008 was the year that the economy started its tailspin, this is the year that Bernie Madoff, Sir Allen Stanford and Ponzi schemes dominated financial headlines. These events have a significant impact on accountants with tax practices and present excellent opportunities to assist clients. Fraud losses are estimated to be in the tens of billions of dollars. Some people lost their entire life savings. Adding to the injury, many of these same people paid taxes for years on "paper" gains that ultimately turned out to be fictitious. At the same time, the U.S. Justice Department and IRS began vigorously examining taxpayers with offshore investments. In times of change and financial unrest there are great opportunities for practitioners to both protect clients from costly audits and assist clients that suffered tragic losses. This article will examine the major changes to IRC Section165 fraud losses announced by the IRS in March. 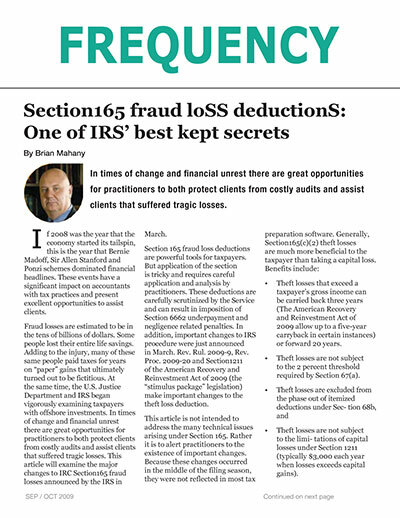 Section 165 fraud loss deductions are powerful tools for taxpayers. But application of the section is tricky and requires careful application and analysis by practitioners. These deductions are carefully scrutinized by the Service and can result in imposition of Section 6662 underpayment and negligence related penalties. In addition, important changes to IRS procedure were just announced in March. Rev. Rul. 2009-9, Rev. Proc. 2009-20 and Section1211 of the American Recovery and Reinvestment Act of 2009 (the "stimulus package" legislation) make important changes to the theft loss deduction. Theft losses that exceed a taxpayer's gross income can be carried back three years (The American Recovery and Reinvestment Act of 2009 allow up to a five-year carryback in certain instances) or forward 20 years. Theft losses are not subject to the 2 percent threshold required by Section 67(a). Theft losses are not subject to the limitations of capital losses under Section 1211 (typically $3,000 each year when losses exceeds capital gains). In general, to deduct a Section165(c)(2) fraud loss, one must prove that the loss resulted from criminal fraud by the promoter (See Viehweg v. Commissioner, 90 T.C. 1248, 1253 (1988) for a more detailed analysis). Losses for stocks and investments purchased on the open market that later lose value because of corporate officers misrepresenting the company's financial condition are not generally treated as fraud losses, however. Determining whether a loss qualifies as a fraud loss is tricky. The amount of the loss is also somewhat difficult to calculate. There can be no reimbursement for any losses for which there is a reasonable prospect of recovery. Determining what is "reasonable" is a question of fact and subject to challenge by the service. Often the Service requires proof of recovery attempts such as litigation. Controversy has also surfaced regarding losses suffered in qualified retirement plans in which the taxpayer arguably has no basis according to the Employment Retirement Income Security Act of 1974 ("ERISA"). In an effort to help many victims of recent Ponzi schemes, earlier this year the service released both a revenue ruling and revenue procedure that dramatically impacts taxpayers with investment losses. The just released revenue ruling (2009-9) clarifies that investment fraud losses are not subject to the limitations applicable to personal casualty and theft losses under Section 165. The promoter was criminally charged or was the subject of a criminal complaint alleging theft or a fraud related offense. The promoter pleaded or was found guilty or a trustee / receiver was appointed to freeze the promoter's assets. Under the safe harbor provisions, taxpayers can generally deduct in the year of discovery 95 percent of their net investment loss less the amount of any recovery or expected recovery from insurance. For taxpayers who are suing persons other than the promoter, the same formula applies but at 75 percent of the net loss. Use of the safe harbor provisions is not mandatory and all other fraud losses remain subject to the traditional methods of determining the existence and the amount of the loss. Taxpayers taking advantage of the safe harbor provision give up their right to ask for refunds for other years. Although there are no reported decisions yet because the rules and procedure are so new, the revenue procedure suggests there may be issues if the taxpayer made or purchased the investment from someone other than the promoter. A careful review of the revenue procedure is necessary before seeking to avail oneself of the §165 safe harbor provisions. During the fall months, practitioners may wish to revisit returns and clients who suffered major losses during last year. The recently announced changes will assist many taxpayers. Practitioners not already familiar with the existing rules and recent changes are strongly urged to consult with tax counsel. With the exception of losses from certain well-publicized scams, the service is likely to scrutinize returns in which the loss is claimed. Audit rates for Section165 deductions have always been high. Many such claims may be initially denied at the revenue agent or service center level. Improperly claimed deductions remain subject to penalties. For clients with truly qualifying losses, however, IRC Section165 remains a potent tool.